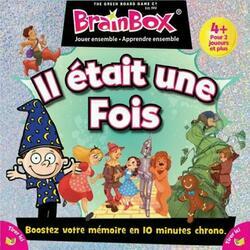 With BrainBox Once upon a time, the children observe a "story" card for 10 seconds and then answer a question indicated by the die. If the answer is correct, the card is won! All types of stories are represented: educational (The Ugly Duckling), mythological (King Arthur and the Knights of the Round Table), modern (Tarzan, Beauty and the Beast)... The most famous tales of the Grimm Brothers, Charles Perrault and other famous authors are in this BrainBox full of wonderful stories. Enough to become unbeatable on the greatest classic tales! A game of observation and memory accessible to the youngest. To develop children's knowledge of children's literature for children. A superb box that sparkles! Contents of the box : 55 cards, 1 die, 1 rule of the game, 1 hourglass.